1) After I adopted Andre, I taught him “roll over”. The funny thing is that he would only roll in one direction. Years later, Wayne showed me the movie Zoolander, and I almost changed Andre’s name. 2) Andre loved to mark. I never got any exercise on our walks because he had to stop by every bush along the way (we joked that he was leaving “peemail” for his doggy friends). One day I came home and saw that Andre had jumped onto the kitchen table so he could mark a vase of flowers. We would always leave the chairs pushed in from then on! 3) My most cherished memory of Andre is when I would take him to the beach. He would smile and run zig-zags across the sand. His exuberance was so uplifting, and it was obvious that this was one of his favorite places. A year after I adopted him, I threw a beach party for Andre and his doggy pals. I made a liver brownie birthday cake, and at one point during the party ALL the dogs on the beach we surrounding me to try and get a piece. So many wagging tails and much happiness that day! 4) I used to bring Andre with me when I taught at San Jose City College. Many of my students were from Vietnam, and there were some communication barriers. They loved Andre, and many times his presence was what helped them feel comfortable talking to me about their lives and their dogs back home, and that enabled me to be a better teacher for them. One day, my students were taking a test, and Andre was lying on the floor in the middle of the classroom. The door was propped open, and he saw a squirrel outside. He bolted out of the classroom, and my panicked students all ran outside to try and catch him. There was also a time when Andre wasn’t eating well, and I couldn’t figure out why until I noticed that he would always sit under the same desk. Turns out that a student from one of my classes had been secretly feeding him burgers. 5) I remember the first time Andre saw a horse. He only saw the legs, and must have thought they were trees. He was about to lift his leg on the horse when it moved and startled him. I’m not sure what he was thinking at that moment, but he was taken totally by surprise. 6). 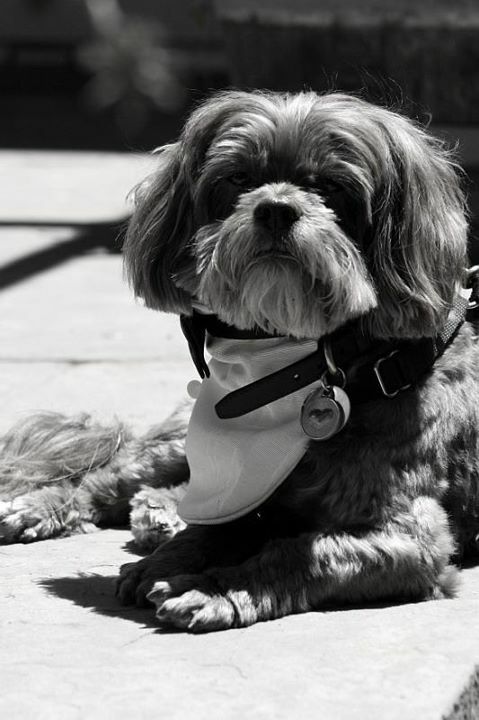 Andre was one of the ring bearers at our wedding, and he wore a tuxedo bandana that my mother-in law made for him. So handsome! He barked at all the right moments during the ceremony. And one more memory. For another birthday we took Andre to a restaurant in Carmel called The Forge in the Forest. They have an outdoor patio and a special menu just for dogs. We ordered Andre the most expensive item on the menu (steak) and he was in total disbelief that it was all for him. We bought him a new collar that day from some fancy dog boutique, and then when Andre had enough he slept in the car, totally blissed out, while we drove home in the rain. 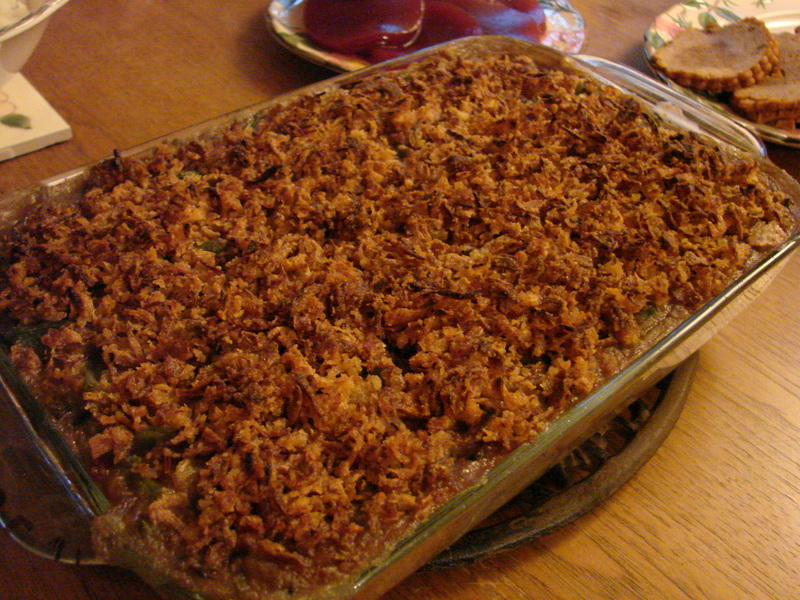 Let’s face it, Thanksgiving can be a challenging time for vegans. So many of the dishes traditionally include loads of animal products, and if you’re less than lucky the meal will include some kind of awkward interrogation about your choice of diet by someone who is smacking on a hunk of turkey. We lucked out this year. My sister in-law, Marcy made a huge feast for about twenty family members, and she managed to put together a pretty hearty vegan spread for us…including a fabulous green bean dish with almonds. We brought some Field Roast Celebration Roast, gingerbread apple pie (from Vegan with a Vengeance), and a double layer pumpkin cheesecake, and we were quite satisfied. Better yet, we loved being around so many fun folks and having a great time together. I have learned from past experience that anything can go wrong on Thanksgiving, and sometimes you can’t get to the big feast. A couple of years ago I came down with a horrendous cold and we canceled our visit with friends. Wayne improvised and came up with a nice meal of homemade seitan sausages and cranberry chutney, but we had few options in the house and we missed many of our old favorites. Because of that, I like to have a second, all-vegan meal planned for later in the weekend, so even if we’re planning to travel we make sure to have all the ingredients we need a few days beforehand. Tonight’s meal was amazing. We had fluffy mashed potatoes, green bean casserole, cranberry jelly, candied sweet potatoes, wild rice, and Field Roast. Wash and peel some Russet potatoes (one potato per person should be enough if you’re serving a lot of other sides), cut into 3/4 inch cubes, and boil in salted water until tender. Drain well and return to the pot they were boiled in. Use a good quality potato masher, such as this one. Mash the potatoes well, but don’t stress if there are a few little lumps. Once the potatoes are mashed to your liking, add a few tablespoons of Earth Balance and a drizzle of olive oil. It’s good to do this with the pot on the stove just in case you decide you need a little bit of heat. Once the Earth Balance and oil are well incorporated, add a touch of salt, and dash or two of freshly ground pepper, and some nondairy milk (I like the unsweetened whole grain drink from Trader Joe’s, but soy milk will also work). You can also add a little bit of crushed garlic. Lightly stir in the milk, adding just a touch more than you think you will need. The potatoes tend to soak up the liquid pretty quickly and you don’t want them to be too dry. If they’re too wet, just leave the heat on for a minute or so. If you mash first and then add the wet stuff, I have found that the final result will be light and fluffy, not gluey at all. 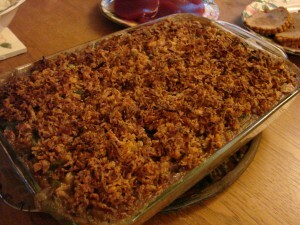 The green bean casserole takes a bit of time, but it’s simple to make. I’m so glad I came across Isa’s version last year. It has an amazing flavor and texture. I find that her version is a bit on the soupy side, so I like to add close to double the amount of green beans than the recipe calls for. If you’ve missed this traditional dish since going vegan, if you want to impress a vegan in your life, or if you just want to get away from that mushroom glop in a can, I hope that you’ll try this recipe. 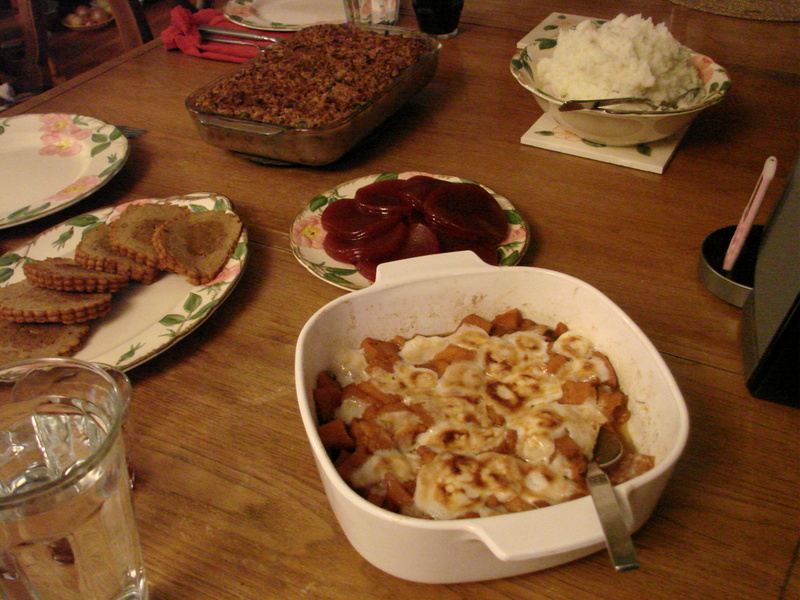 The sweet potato dish was actually quite easy. I usually prefer to cook my sweet potatoes with savory herbs and sea salt , but Wayne grew up with the intensely sweet version with marshmallows on top. I thought he would enjoy this, and I was right. I didn’t want a ton of leftovers since this isn’t exactly health food, so I kept it small. 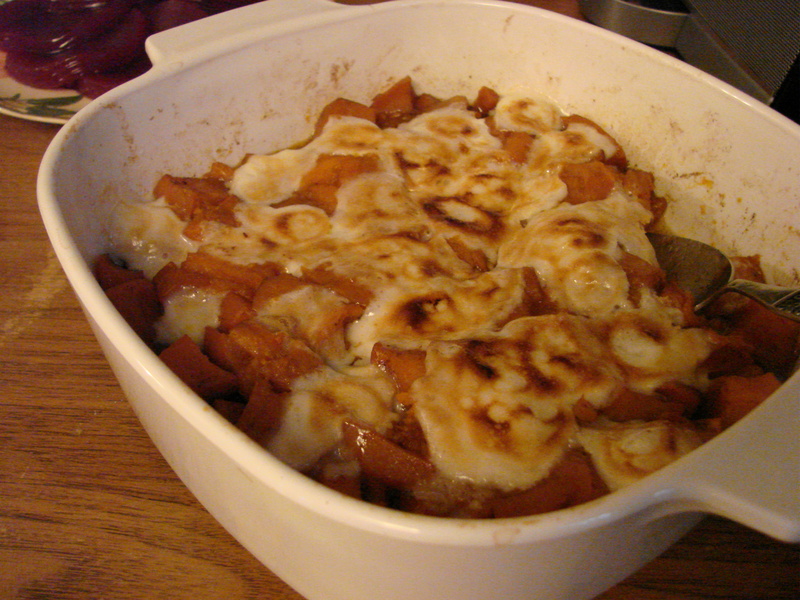 Put the sweet potato pieces into an 8×8 inch casserole dish. Put Earth Balance, brown sugar, salt, nutmeg, and ginger into a saucepan and heat over medium-low heat until the sugar is mostly dissolved. Put over the sweet potatoes and toss well. Add a splash of water. Bake, uncovered for 45-50 minutes. Remove from the oven and sprinkle the marshmallow pieces on top. Put under the broiler for 2-3 minutes, or until the marshmallows turn a light golden color. We hope that you had a delightful Thanksgiving, and that no matter what you ate or who you celebrated with that you were able to take some time to remember what you are thankful for. Whether it’s a cat who likes you, a pair of hiking boots, or your special ability to tell a good joke, find joy in what you have. Sometimes it takes a lunch date gone awry to remind me to be grateful for the times when folks have sense of etiquette. My friend arrived late, answered the phone twice during our meal, and didn’t have enough money to pay for lunch. Oy vey! Was my meal a total failure? No way! We were having lunch at Hoang Tra, a little neighborhood restaurant in Richmond. And this place has an abundance of terrific food and vegan options galore. One of their secrets is this mock chicken that is far meatier than anything I’ve had before. 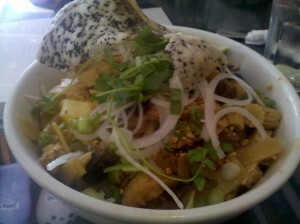 Pretty much all of the chicken dishes on the menu can be substituted with the veggie chicken. I’ve asked dozens of times how they make it, and the usual response is that it’s pressed tofu. I knew there had to be more to it than that, and my server this time told me that they buy it from Layonna, which is this really fun store in Oakland that sells all different kinds of mock meats. Some of their products are better than others, but we’ve found some that are quite good. Some old friends of ours make pulled pork sandwiches out of their mock pork, and it’s delicious. I can’t wait to buy some of this mock chicken to experiment with myself. This lunch was made with a mock duck, which was flavorful but didn’t have the same meatiness as the mock chicken. It didn’t matter, because the whole dish was so full of flavor and texture, and I was so thrilled with myself for trying something new. It was full of bamboo shoots, baby corn, onions, cilantro…all sorts of goodies. It was nice and brothy, had a touch of chili, and came with lime wedges to squeeze on top. Blissful! When I moved from Santa Cruz to the east bay, I couldn’t wait to find places that were unique that I could get excited about, and this is one of many that I have found in the past few years. I hope you will try this restaurant someday. Just please…for goodness sake…hang up and eat!